Improved riding experience for commuters and better driving conditions for drivers summarized the first few months of rollout of modern jeepneys. These are the findings of Hino Motors Philippines, exclusive distributor of customized Hino trucks and buses in the Philippines, which visited the Pateros-Fort Bonifacio Transport Service and Multi-Purpose Cooperative and Taguig Transport Service Cooperative a few months after endorsing Hino modern jeepneys to the cooperatives in support of the government’s Public Utility Vehicle Modernization Program. 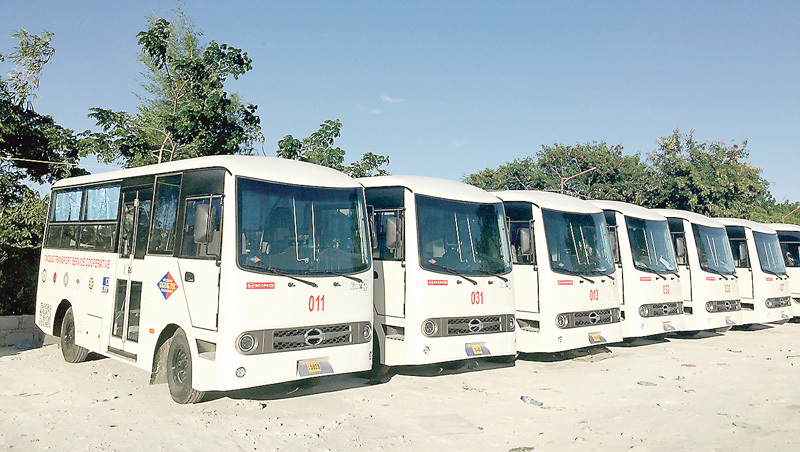 Hino turned over 13 air-conditioned jeepneys to Pateros-Fort Bonifacio TSMC and 20 non-air-conditioned units to Taguig TSC during its second turnover ceremony held recently. The Euro 4-powered Hino Class II jeepneys have a seating capacity of 23 with side-facing passenger seats resembling the conventional jeepney. Their design accommodates standing passengers to maximize the vehicle’s capacity. Euro-IV powered Hino jeepneys now ply the Fort Bonifacio-Taguig route. Tailor-made to requirements set by the Bureau of Philippine Standards, the modern jeepneys are also air-conditioned and equipped with a Beep Card system, speed limiter, GPS, CCTV and a dashboard camera. Still in the initial stages of plying the roads, the modern jeepneys involve the assistance of a passenger assistance officer in place of the Beep Card system. PAOs collect passengers’ fares and inform the driver when they are getting off. Emerson Vizconte, a jeepney driver with the Pateros-Fort Bonifacio TSMC, noted the advantages of the modern jeepneys in comparison with old jeepneys. “Okay po ang performance nito. Bukod sa malamig ay maganda po siyang tumakbo at di pa ako nakararanas na masiraan,” he said. Jose, a driver with the Taguig TSC who has been driving jeepneys for 12 years, had some misgivings about switching to modern jeepneys. “Noong una, nag-alangan ako kasi baka masyadong iba itong modern jeepney doon sa nakasanayan ko. Pero noong nahawakan ko na ‘yong unit, okay naman pala. Mas magaan at mas komportable imaneho ang modern jeepney kaysa sa dating jeepney,” he shared. In addition to better working conditions, the PUVMP aims to give operators and drivers benefits such as SSS, PhilHealth and accident insurance. The Pateros-Fort Bonifacio TSMC and Taguig TSC are also looking to supporting their drivers with fixed salaries to replace the boundary system. Freddie Hernandez, chairman of the Taguig TSC, expressed his appreciation for Hino’s service. “Isa sa mga kinatutuwaan namin kay Hino ay kapag may problema at tinawag namin sila, nandiyan agad sila, nakaalalay. Ipinapakita nila na very supportive sila sa project. Nababaon kasi kami kapag tumitigil at hindi umiikot yung gulong ng jeep. Pero ngayon, dahil sa magandang assistance ng Hino, madaling naaayos ang mga problema at walang back time,” he said. “The country’s transport system is long overdue for a real shakeup,” said Vicente Mills, Chairman of Hino Motors Philippines. “The Department of Transportation envisions a structured transport system that involves small, medium and large vehicles plying structured routes. The modern jeepney project is the first of the series of changes that DOTr wants to implement in the next few years. We at Hino hope to continue being a part of this endeavor in line with our mission of ensuring the welfare and safety of the Filipino riding public,” Mills added.